Business is tough, and there is no guarantee that you’ll make it. Today’s current economic climate and conditions make it especially challenging and uncertain. But should that stop anyone from starting one? Uh…no. I mean, almost everything that entails starting and maintaining a business involves risk. Every area. Sure, there are calculated risks, but they are risks nonetheless. One week ago, I went to a creative conference in Detroit, called the Futures Conference. One of the threads and themes that ran through with each presenter was this idea of “permission to fail.” Doesn’t sound very fun on the surface does it? Like it or not, failure is a natural part of the process. You can’t learn or grow anything without it. While certainly not fun to go through, sometimes failure can’t be viewed as a complete negative. Some might see a coffee shop closing down as a failure. I say it’s not. The owners took the adventurous risk, and now they won’t have to live their life wondering and regretting not having done it. Experiencing regret is worse than experiencing risk. Wow, that’s good, I will type that again. Regret is worse than risk. And regent is probably worse than failure too. And failure is part of the success process. 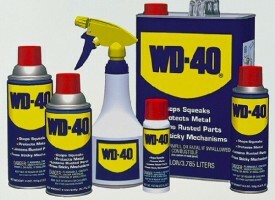 Do you know where the name WD-40 comes from? Take a guess. Here’s a hint: 39 failed attempts. Wikipedia it if you don’t believe me. How many times did Edison “fail?” Supposedly over 1,000 times. Can you imagine? When asked about it, Edison allegedly said, “I have not failed 1,000 times. I have successfully discovered 1,000 ways to NOT make a light bulb.” At least he had his humor in tact. I probably would have gave up at try # 679. So, maybe you’re thinking about starting something. A business. A band. A family. And you’re scared. Whatever that idea or endeavor is that is haunting and nagging at you, will you give yourself permission to fail?